Artist Trading Card Kit of the Month - December 2018 - House Shaped Christmas themed kit. This kit includeds: 1 - 3 in. x 4 in. 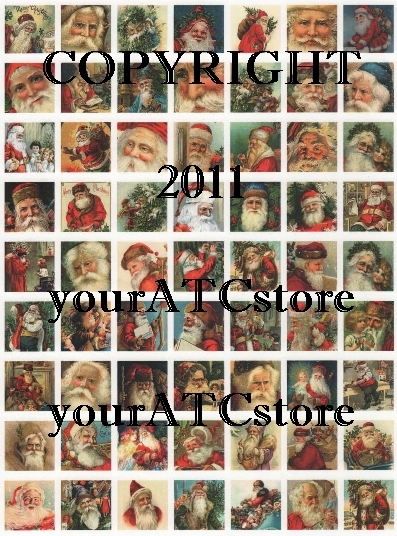 piece cut from Simple Stories double-sided Vintage Christmas Collection - Deck the Halls, 1 - 3 in. x 4 in. piece cut from Simple Stories double-sided Vintage Christmas Collection - Jolly Holidays, 1 - 2 1/2 in. x 3 1/2 in. ATC cut from Darice cardstock in Jolly Green, 1 - 1/8 in. to 1/4 in. x 4 in. piece of Core-dinations Opulant Opal glitter paper that has been cut on one side with zigzag scissors, 1 - 1 in. x 4 in. piece of polka-dot embossed Bazzill cardstock in Red, and 1 - 1/2 in. x 4 in. piece of Americn Crafts green and red plaid paper #341344. Also included is an artist trading card size house shaped template (follow instructions on template for cutting and scoring), 1 - Santa image that has been professionally printed for you 1 - Merry Christmas red framed sign that has been professionally printed for you. 1 - vintage inspired white lace, 2 - pieces of wired light green tinsel garland, 1 - piece of hunter green tinsel garland; This is perfect for the top of the chimney, 1 - piece of felt pine tree ribbon in olive green; this can be used for the outside of your house, 2 - tiny metallic brads; one green and one red, 1 - Silver Santa Charm, 1 - Silver Reindeer Charm, 1 - Merry Christmas and 1 tree sequin either in red or green (both colors are shown in the photo) and lastly a Clear ATC sleeve (not shown in photo). 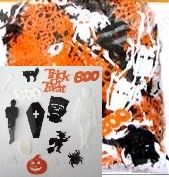 The charms along in this kit are worth over .65 cents.